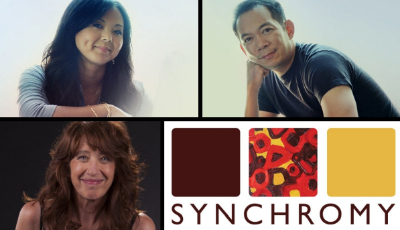 Synchromy, Los Angeles’ own composer-directed new music collective, teams up with PLR (the powerhouse piano trio of Alyssa Park, Tim Loo, and Vicki Ray) to present a program of exciting works for piano trio. Selected with input from both groups, works include Pēteris Vasks’ Castillo Interior for violin and cello, the world premiere of an extended version of Ethan Braun’s …what we call progress… for three piano trios (“two digital and one real”), which was premiered earlier this year at the Copland House, and Dante De Silva’s Wake the Dead for piano trio. The program will also include works by Chapman professors Chinary Ung and Sean Heim.